The Global Sawlog Price Index (GSPI) increased substantially, driven by strengthening lumber markets in both the US and Europe, reports the Wood Resource Quarterly. The Euro-based ESPI sawlog price index fell in the 4Q/17 after reaching a two-year peak in the 3Q/17. Seattle, USA.In the 4Q/17, the Global Sawlog Price Index (GSPI) rose one percent from the previous quarter to reach just over $76/m3. This was the fourth consecutive quarter-over-quarter rise, with the GSPI being up 9.8 percent in one year. Sawlog prices have gone up universally in US dollar terms in 2017, with the biggest growth occurring in Eastern Europe, the Nordic countries and in Western North America, while the price movements have been more modest in the US South, Latin America and Oceania, according to the Wood Resource Quarterly (WRQ). Sawlog prices in the Western US have seen a spectacular increase in less than two years. A combination of restricted log flows due to wildfires, low sawlog inventories, and strong domestic lumber markets resulted in a substantial jump in sawlog prices in the western states in the 4Q/17. This came at a time when prices had already been slowly trending upward for over a year. In the 4Q/17, average prices for Douglas-fir and hemlock sawlogs were about 27% higher than in early 2016, making the current price levels the highest recorded since the WRQ started tracking sawlog prices in 1995. 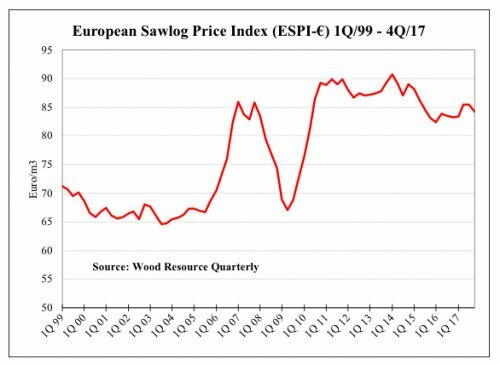 With a few exceptions, sawlog prices in Europe were lower in the 4Q/17, which resulted in a 1.2 percent decline quarter-over-quarter of the European Sawlog Price Index (ESPI). This came after the index reached a two-year peak in the 3Q/17. By far the biggest price increase in 2017, in Euro-terms, was in Eastern Europe, where demand for sawlogs increased as lumber production rose. In addition, log supplies around the Baltic Sea region were tight because of unfavorable weather for logging and transportation, adding to upward price pressure in the second half of 2017. Note:The GSPI and ESPI price indices are volume-weighted indices comprised of sawlog prices for log grades commonly used for manufacturing lumber into construction and better grade lumber in the largest log-consuming countries in the world and Europe, respectively. The indices track prices from the 1Q/95 to the current quarter and are published each quarter in the WRQ.